Deep within Vienna’s southern woods there is a beautiful daylit family home that appears to glow. The open plan Gemini House is wrapped in translucent polycarbonate that allows natural light to fill every corner. Designed by AL1, the energy-efficient home has a green roof and it was built using local, natural materials and industrial building solutions. 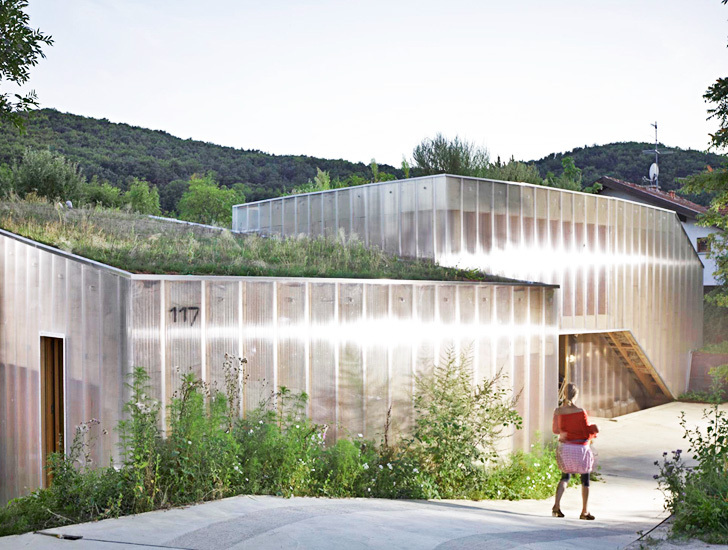 AL1’s translucent family home is located in the woodsy area of Weissenbach in Lower Austria. It consists of two L-shaped volumes connected by a patio and surrounded by trees and luscious vegetation. The home is filled with natural light thanks to its many windows and its polycarbonate skin. The house was built using wood from the surrounding forests, clay from the excavation of the heated floor, and fast-growing hemp from the nearby Czech Republic as insulation. The open, bright and airy home’s plentiful windows welcome fresh breezes from the forest for natural ventilation. The architects plastered the ceiling and walls with a composite mix of concrete and local wood. AL1’s translucent family home is located in the woodsy area of Weissenbach in Lower Austria. It consists of two L-shaped volumes connected by a patio and surrounded by trees and luscious vegetation. The home is filled with natural light thanks to its many windows and its polycarbonate skin. The house was built using wood from the surrounding forests, clay from the excavation of the heated floor, and fast-growing hemp from the nearby Czech Republic as insulation. The open, bright and airy home's plentiful windows welcome fresh breezes from the forest for natural ventilation. The architects plastered the ceiling and walls with a composite mix of concrete and local wood. Deep within Vienna’s southern woods there is a beautiful daylit family home that appears to glow. 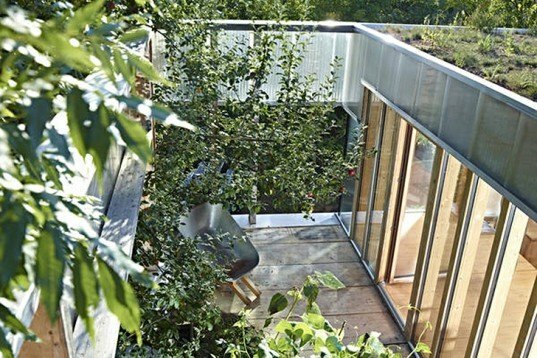 The open plan home is wrapped in translucent polycarbonate that allows natural light to fill every corner. Designed by AL1, the energy-efficient home has a green roof and it was built using local, natural materials and industrial building solutions.